Where oh where has kidney been? 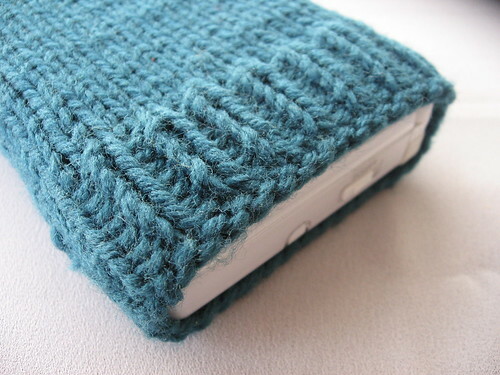 I made a Seamless Nintendo DS Lite Sock as a belated Mother’s Day gift for my mom. She started out playing Tetris on the original Nintendo Gameboy my brother and I bought as kids and now owns a few versions of the newer Gameboys. 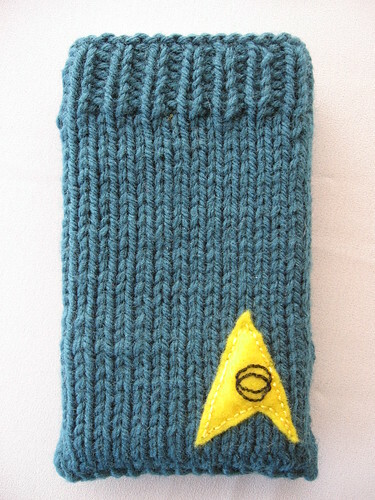 I modeled the cozy after Spock’s uniform since my mom is also a Star Trek fan. 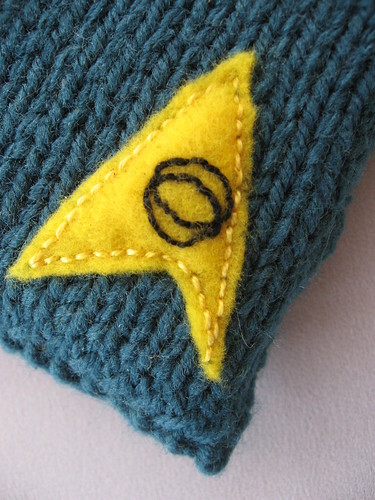 The yarn is Red Heart Super Saver in Country Blue and the felt Starfleet insignia was copied from an illustration of the Starfleet insignias from Danhausertrek.com. The site is dedicated to the the Animated Series, so I’m not sure if it is completely accurate to Star Trek: The Original Series. I couldn’t find gold felt at the craft store, but they did have this bright yellow. I’m not sure how well the craft felt will hold up to heavy use; it felt a little flimsy. There’s another layer of felt under the insignia to plump it up and hopefully reinforce the applique. The DS Lite Sock pattern is double knit, which means you cast on a certain number of stitches on straight needles and knit the front and back at the same time. I was confused with the directions to start since it doesn’t actually spell this fact out to you. Once I understood the idea of double knitting, the whole project turned out to be very easy. You only need to know knit, purl and the slip stitch to work this cozy. The gauge is pretty tight with worsted weight yarn and small needles. The pattern estimates needing size 6 needles but I ended up using size 2s. Possibly I’m a loose knitter? Also, I had to restart a couple times because the smaller needles were harder for me to use. With the right gauge, the sock fits really nicely and there are no seams to sew. The Vulcan Nerve Pinch was invented by Leonard Nimoy as a way for Spock to overpower opponents without having to resort to violence. Photographs taken with a Canon PowerShot A530.